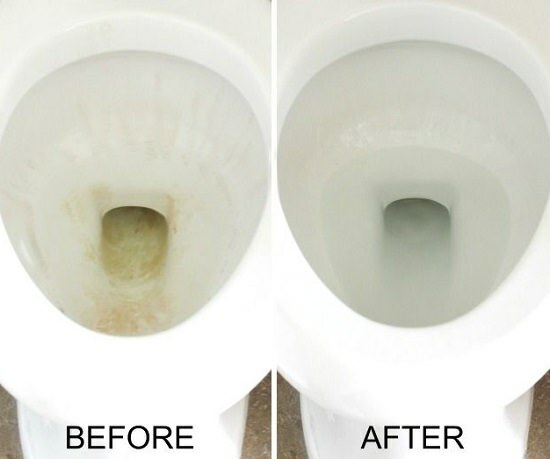 Follow this article on how to clean a toilet with white vinegar to get the cleanest toilet naturally! My home looks neat and tidy all the time. Ever heard this phrase? Yea, I’m pretty sure you have listened to it and also said it many a time. Cleaning our homes and keeping them tidy all the time is a tedious task and we as a mom, know this! But it’s hard to make my family understand this. I think they don’t like it clean, but hey, it’s our responsibility to keep our place clean. Since cleanliness is next to godliness. I take pride in telling you that I’m successful most of the times in cleaning my home. But there lies an exception- My toilet. Although the bathroom is always clean, the toilet is most of the times dirty. Especially when my little son comes home. It becomes so tedious to clean it often. After searching and experimenting with many of the products, I found an unexpected product which cleans my Toilet Bowl so quickly and is cheap too! Its vinegar, yes you read it right! This is the magical ingredient which has saved my time and efforts in cleaning my toilet. It’s so cheap, you can get it anywhere. It would probably be in your house right now! Keep it undisturbed for 20 minutes. Wipe the stained toilet areas with a brush or rough cloth piece. Tada!! There you have it! A clean and sparkling toilet. Vinegar breaks the toilet stains and makes it easy for you to remove it, just wipe it off. Now, you can be free from the toilet nightmares. This made my work easy, now I don’t have to worry about my toilet anymore. I can enjoy the time with my family, and yes I am no more angry with my little boy! How to Reduce Fat in Face Cheeks | How Can I Reduce Fat on My Face?